IRGC Commander Major General Ali Jafari dismissed what he called U.S. Secretary of State John Kerry's threat of military action against Tehran over its nuclear program, Iranian media reported. Kerry had said that the military option was still on the table if Iran did not live up to its nuclear commitments under Geneva’s Joint Plan of Action it signed with the six world powers in November. Kerry made the comments in response to a question at WEF in Davos that what happens if Iran did not implement its commitments under the Geneva deal. Gen. Jafari called the threat “ridiculous.” He asked Kerry to stop repeating “bankrupt strategies such as the use of military power.” Jafari added that such comments help the cause of the "revolutionary Islam." 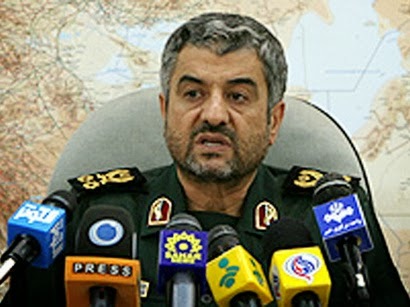 IRGC deputy commander was more blunt and repeated Iran’s own old threat. On Sunday, Iran’s foreign ministry spokeswoman Marzieh Afkham said Kerry’s comments were in violation of international laws. Kerry also elaborated on some of the outlines of a permanent deal with Iran. The stinking Islamic terrorist regime only has fear towards the Iranian people. That's why filthy occupying regime has so many IRGC and basiji dogs to protect themselves from peoples anger. It is noble to fear your people the masses than to fear a self styled superpower-TELLING OFF or speaking your mind to a bully or standing for the truth is a duty for a Muslim. the stinking islamic Regime is more stabnle as all other US Puppet Regime in the middle east. all middeleast is in Trouble even Turkey is in Trouble , but iuran is tstable. dio say this fact to you something ? There is nothing "noble" or "stable" about a filthy stinking terrorist regime which has been occuyping Iran through deception and armed terrorism against its oppressed people. You are right,the Barbaric and Anti-Iranian Terrorist Puppet Regime is temprorary "stable". Because they are being fully supported by all the combined anti-Iran countries like US,Britain,Russia and China. Turkey has only US support. Anon 10:34 AM, what is the evidence of the USA and Britain supporting Iran? Go and say that to the thousands of victims of the Islamic terrorist regime who have been raped.tortured and killed in cold blood.